In my earlier post this morning, I wrote about little Milton Josephs, not yet two years old, whose cause of death was listed as marasmus on the Federal Census Mortality Schedule for 1880. I was horrified that a child living in Philadelphia in a middle class home in 1880 could have died from starvation. My medical consultant, whose expertise is in pediatrics and anesthesia (and who is also my brother, for those of you who haven’t figured it out), also thought that it seemed strange that a child would have died from severe malnutrition without there being some other underlying cause such as cancer or some syndrome that prevented him from being able to absorb nutrients. His questions made me go back to see if I could find the actual death certificate for Milton on line. My initial searches on both ancestry.com and FamilySearch.org had failed to pick up Milton’s death certificate no matter how I tried searching or spelling his name. But this time I realized there was another way to search. Ancestry.com had a record for Milton in the index of Philadelphia death certificates, but no image of that actual certificate. But the record included the FHL film number, that is, the catalog number for the microfilm in the Family History Library in Salt Lake City. For some reason, I’d never before tried searching by the FHL number on FamilySearch. I know to those out there who are experienced genealogists this must seem like a terrible rookie mistake, and I am quite embarrassed that I’d never thought to do that before. 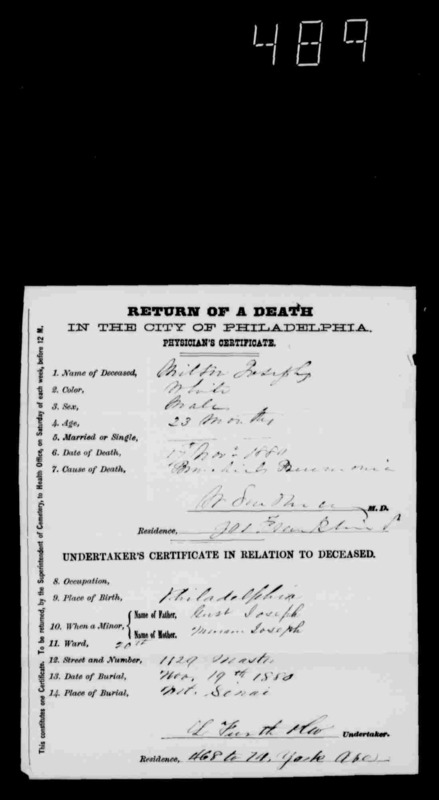 “Pennsylvania, Philadelphia City Death Certificates, 1803-1915,” index and images, FamilySearch (https://familysearch.org/pal:/MM9.3.1/TH-266-11063-42231-79?cc=1320976 : accessed 14 December 2014), 004058647 > image 406 of 969; Philadelphia City Archives and Historical Society of Pennsylvania, Philadelphia. It is a bit hard to read, but if you look carefully you can see that on the certificate it says Milton died from bronchial pneumonia, not marasmus. My brother agreed that this was a much more likely cause of death for a boy living at home with his family in Philadelphia than starvation, and he thought it was unlikely that somehow marasmus led to pneumonia or vice versa. Then why would the 1880 Federal Census Mortality Schedule have said the cause of death was marasmus? Well, once again I am embarrassed. I looked more closely at the mortality schedule, and sure, it says M. Josephs, and sure, ancestry.com retrieved it as relating to Milton Josephs, but I should have looked more closely. Because now that I have looked again, I realize that the schedule says that M. Josephs was 5/12, that is, five months old. And a little more research uncovered the death of a child name Mike Josephs who died of marasmus in December 1879 at five months of age. So stupid mistake number two: I too quickly assumed that M. Josephs was Milton without reading the document carefully and without even stopping to think that Milton had died in November, 1880, too late to have been listed on the Federal Census Mortality Schedule for 1880, which was dated May 31, 1880. So I apologize for my carelesness and for maligning the reputation of my ancestors whose son died from pneumonia, not starvation. Do I feel any better about Milton, knowing that he did not die from starvation? I suppose that I better understand how a toddler can die from pneumonia than starvation, especially in the era before antibiotics. But no, I don’t feel better. A little boy died what still must have been a painful death, and his family still lost a beloved child. And another family, that of Mike Josephs, did lose a five month old baby to starvation. There is no good news here, but I did learn a few important lessons. Thanks to my brother, I was able to find my mistakes and set the record straight. 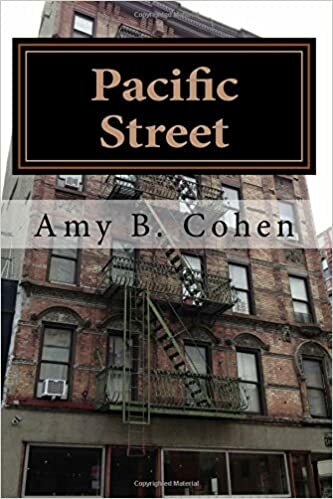 This entry was posted in Genealogy, Miscellaneous information and updates, Nusbaum, Pennsylvania, Philadelphia and tagged Death, Death certificate, Family History Library, FamilySearch, genealogy, marasmus, mistakes, Nusbaum, pneumonia, starvation by Amy. Bookmark the permalink. We all make mistakes! You’re quite right, though, that the correct answers are not much comfort. So much sadness and misery for those poor folks. Thanks, Pancho. I don’t like making mistakes, but I certainly do all the time. Usually I catch them BEFORE I post, but this time it was too late. But I do feel like I learned a lot from making these mistakes and thus am happy to share what I learned with others so they might avoid the same errors! I couldn’t make out the name on the mortality schedule you posted, and I wondered whether Mike could have been a younger brother of Milton. I thought I could answer the question by seeing the parents’ names and addresses, so I went looking on Ancestry.com. I found that the 5-month-old baby who died of marasmus was actually named Joseph (or Mike Joseph) Doroschinzky. the son of Joseph and Maria Doroschinzky, and he was buried in a Roman Catholic cemetery. So he was definitely in a different family. Sad story, though. Yes, that is the same one I found after re-checking the mortality schedule, so I knew he was not a relative. I don’t know why he is listed with a different surname from his parents, but I have enough trouble finding my own relatives to try and find out what happened to poor baby Mike. Very sad indeed. Thank you so much for reading and commenting and for checking this out. Ah, yes, I’ve had that happen so many times with other people’s trees. I try to explain their mistakes, but 90% of the time people just don’t want to take someone off the tree or make the change. Just this week I had one relative merged into another family with different children. But we all do make mistakes, and most of us do try to learn from them! That’s so true. I’ve learned so much from my mistakes (some of which still embarrass me to think about). And like you, have tried to correct errors where I’ve found them. It does amaze me how tenacious people can be in the face of overwhelming evidence that they just “got it wrong.” Sigh! Well, I have found that the older I get, the sooner I am willing to admit my mistakes!! Me too; I think it’s all part of just being more comfortable with who I am, and not bothered so much about what others think. Everyone makes mistakes and that’s why you did the right thing by looking deeper into the matter. Be glad it’s just a genealogy mistake and not a language one. That’s hysterical! Yes, language mistakes can be embarrassing, but at least you only embarrass yourself, not some long dead ancestor!